MANHATTAN, Kan. – A big second-half push, including 14 points from senior Dean Wade, helped No. 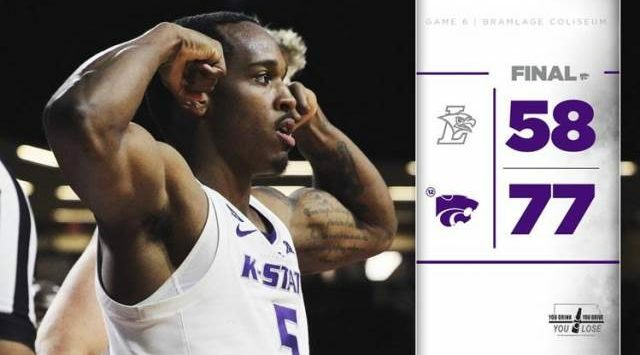 12/12 Kansas State knock off Patriot League foe Lehigh, 77-58, on Saturday afternoon at Bramlage Coliseum to give the Wildcats their best start to a season in 14 years. K-State (6-0) is now 98-6 in non-conference play at home since the 2006-07 season with wins in 88 of its last 92 non-conference home games. The Wildcats have won 26 straight non-conference games at Bramlage Coliseum. After winning the U.S. Virgin Islands Paradise Jam on Monday, November 19, K-State have earned its best start to the season since 2004-05 when the Wildcats opened the season 8-0. Wade scored 14 of his game-high 18 points in the second half to pace four players in double figures, as he added 8 rebounds, a team-tying 5 assists and 2 steals in 34 minutes of action. Fellow senior Barry Brown, Jr., scored 16 points, while senior Kamau Stokes and junior Makol Mawien chipped in 10 points each. With his 16 points, Brown moved into ninth place all-time in scoring, while he added 4 steals, all in the first half, to become the second Wildcat to eclipse 200 career steals and move within 8 of Jacob Pullen’s all-time record. The hot start to the season comes in part due to K-State’s strong defensive play, as the Wildcats have held four of six opponents under 60 points in the game. Entering Saturday’s contest, the defense ranked 11th nationally in scoring defense and 19th in turnover margin (+6.0), both categories the team improved upon on Saturday. Lehigh was led by sophomore center James Karnik, who scored a team-high 15 points on 6-of-7 shooting, as three Mountain Hawks scored in double-digits. The squad was held to 39.3 percent (22-of-56) shooting from the field as a team, including 28.1 percent (9-of-32) in the second half. In the opening minutes of action on Saturday, Brown, Jr. eclipsed 200 career steals by forcing three steals just four minutes into the game, including a steal and score in transition to put the Wildcats up 9-7 with 15:42 left in the first half. The first half served as a back-and-forth affair, with the lead changing five times, including nine ties. It wasn’t until after the midway point of the first half that a team led by five points or more. Behind the strength of two straight 3-pointers from Lehigh junior forward Pat Andree, while making 4-of-5 from the field as a team, the Mountain Hawks found their largest lead of five with 5:37 left in the first half. The lead did not last long, as K-State drew the score even at 31-all with 3:29 left in the half, before garnering a lead just before the break, as the Wildcats went into the locker room with a 37-35 lead. Brown led the Wildcats with 9 points on 4-of-9 from the field, as the team shot 40.6 percent (13-of-32) from the field as a unit. The team benefitted from stifling defense, including 4 steals from Brown, as K-State forced Lehigh into 11 turnovers. Despite the tight first half, the Wildcats came out firing in the second half, opening with a 6-0 run in the first three minutes. The run was put together with 4 points from Wade, including a layup on a pass from Stokes to put K-State up 43-35 with 16:50 left in the game. With the offense flowing for Wade, he also made an impact defensively, including a block on Lehigh’s Kyle Leufroy. Wade’s block came at a crucial time, as K-State opened up a 10-point lead (50-40) with 13:47 remaining. Leading by 9, the Wildcats opened their lead to 12 with a 3-pointer from the top of the arc from sophomore guard Mike McGuirl, his first basket of the game. With Brown, Wade and Stokes all in double-figures in scoring, Mawien joined them on after scoring an and-one, distancing the Wildcats from the Mountain Hawks, 66-52 with 4:02 left in the game. The Wildcats went on to find their largest lead of the game at 22 points after a 3-pointer from freshman guard Shaun Neal-Williams en route to a 77-58 victory. As a unit, K-State shot 41.5 percent (27-of-65) from the floor and 80.9 percent (17-of-21) from the free throw line, while securing 41 offensive rebounds. With 14 points in the second half, senior Dean Wade was the difference on Saturday, scoring 18 points on 6-of-12 from the field, while adding 8 rebounds, 5 assists and a block. Wade’s 18 points mark his 68th career double-digit scoring performance. 2004-05 – With Saturday’s victory against Lehigh, K-State earned its best start to the season since the 2004-05 season, when the Wildcats got off to an 8-0 start. This year, K-State has gotten off to a hot start, including a tournament victory in the U.S. Virgin Islands Paradise Jam.